The carrier is not attached to any outstanding claims. A claim is outstanding if it is unsent, sent, or unresolved (in other words, it has not been paid). The carrier cannot appear on the outstanding claims report either. You must delete or pay any outstanding claims before you can delete the carrier. The carrier does not have any subscribers for any of the plans associated with it. You must first remove the plans associated with that carrier from all associated subscribers before you can delete the carrier. No providers, including locations or corresponding billing entities that are set up as billing providers, are contracted with the carrier. You must first deselect that carrier in the Contracted with section of the settings for all contracted providers and locations before you can delete the carrier. If you delete an insurance carrier that was added to Dentrix Ascend from the list of supported carriers that Henry Schein One maintains, the carrier is removed from your organization's database but not from the list that Henry Schein One maintains. 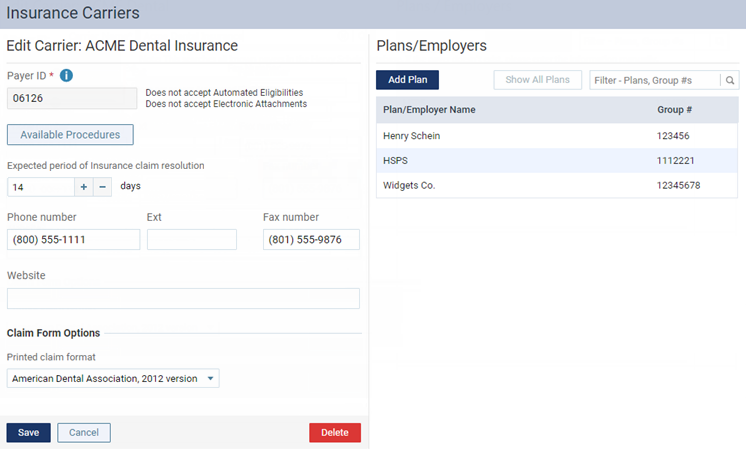 The options for editing the insurance carrier's information become available.